For my second AAR for Command: Modern Air/Naval Operations, I decided to tackle the scenario Operation Lightning Strike, a nightmare scenario for the US. There is nothing more frightening to U.S. military planners than nuclear weapons falling into the wrong hands. Unfortunately the most likely places this could happen also present significant political and military challenges. That being so the US must be agile and decisive when using its military power to prevent what could be a horrifying opening to a Third World War. In mid 2014 a Pakistani Army Brigadier with extremist ties has managed to convince his command to seize a Pakistani nuclear weapons site demanding that all US forces leave the region and Kashmiri territories be returned to their rightful owners or “God’s fury” will be unleashed upon Indian and US forces in the region. The United States cannot stand for this and must act. Due to current commitments the US does have significant assets in the region however they must be used well to succeed as Pakistan is a significant military power and an ally. 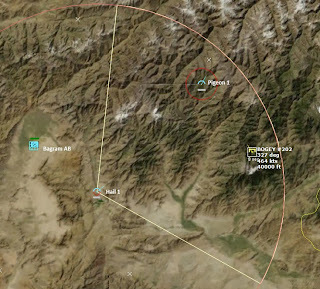 Thirty six hours ago Pakistani forces went on high alert and several hours later intelligence assets indicated that heavy fighting was underway close to a key Air Force base and nuclear storage site in the northern Pakistan. Information from the Pakistani government, ISI and Army was panic ridden and confusing at best giving no clear idea of what was going on other than that local forces were fairing badly and supporting forces were not moving fast enough. By day break all cable news networks had received a recording of a lone Pakistani Brigadier demanding that Indian forces leave Kashmir and that US forces leave southwest Asian entirely or be swept away by “God’s Fury.” His point was driven home by very clear video of a captured Minhas Air Base, a nuclear weapon site and several armed ballistic missile launchers. The Pakistani government responded by issuing a statement that this is an internal problem and that it would consider any external interference an act of war. The United States is now facing its worst nightmare: A hostile nuclear non-state actor operating within the borders of distant ally. 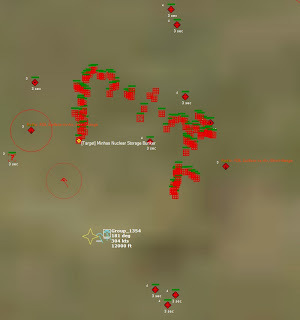 Pakistani Belligerents: Command believes that belligerent forces are composed of elements of the 12th Independent Armored Brigade which are likely in defensive positions in and around Minhas Air Base. Although the force is mostly land based their order of battle does include air defence equipment and any abandoned equipment at the air base. Possible threats include Crotale air defence system, more portable MANPAD missile systems and 35mm AAA guns. There is no indication that any elements of the Pakistani Air Force are collaborating with these forces at all. 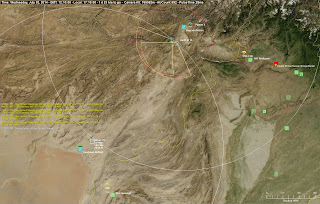 Pakistan: All Pakistani forces are on high alert and are likely hostile to any known or unknown aircraft approaching their territorial boundaries. Command has detected significant activity from all Pakistani air defence zones including regular combat air patrol flights and active SPADA/Aspide and SA-3 SAM missile sites. The Pakistani Navy does have SAM equipped warships at sea as well. All indications are that they are prepared to defend their air space. Iran: No official statements have been issue from Tehran. Iranian forces have gone on alert and are arrayed to defend their aerospace. Command has detected increased readiness at Iranian air bases and air defence sites. All indications are that they are in a defensive posture. India: Indian forces are mobilizing are on high alert. India has stated that it will not be threatened by Pakistan. 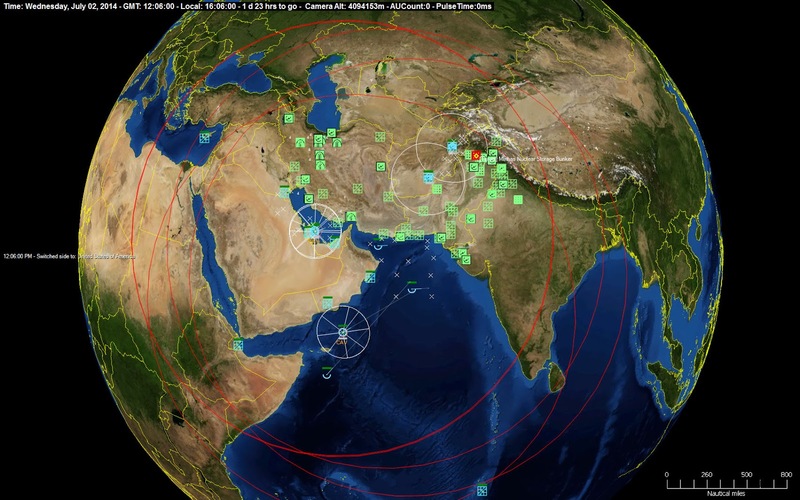 Command has detected increased readiness at Indian air bases and air defense sites. All indications are that they are in a defensive posture. Nuclear readiness has increased. You are to identify and destroy the nuclear storage bunker and any deployed TEL [Transporter Erector Launcher] vehicles at PAF Minhas within 2 days. At command discretion and by all means necessary. If you do end up violating a neutral’s air space or in confrontation with Pakistani regulars or a bordering state you must still meet your primary objectives. To say that this mission scares the crap out of me is an understatement. If I screw this up, there could be a nuclear war. I do have a lot of assets at my disposal, which is good, because I need options. I need to destroy not only the nuclear weapons storage bunker, but any TEL vehicles in the area. At the start of the mission, I know the location of the bunker, so I just have to drop some bunker-buster bombs on that thing and mission accomplished, right? Wrong, because I don’t know where the TEL vehicles are. I could blow up the bunker and then the terrorists promptly respond by launching missiles. I need to take out the TELs first, if not in coordination with taking out the bunker. What I need to have is some serious recon of the area, set up patrols all over the place, tanker assets ready to refuel possible strikes, and arm my strike aircraft to take out the targets as soon as they are located and identified. I have to be careful, though, as I have no idea what might make the terrorists decide to launch missiles. For all I know he might decide to launch upon the simple detection of an unknown aircraft overhead. A complication to all this is that the Iranians, the Pakistanis, and Indians are all on alert--jumpy is probably a better term--hostilities could break out at any time, and things could get extremely messy. So until I am I ready to strike, I need to try to keep things as quiet as possible. When I do strike, I need to get in and out fast. Combat Air Patrols were immediately setup. At Kandahar Airfield in Afghanistan, an RQ-170A Sentinel (Ghost 1) is sent on a patrol of the Pakistan border to do some recon, and at Bagram Airbase an MQ-9B Reaper was launched (Pigeon 1) to do the same. Behind it, Hail 1 and 10, a pair of F-16C Blk 40s, were readied to begin a CAP of the area. In the Persian Gulf, USS Hopper and USS Winston S. Churchill began a sea patrol to take stock of the situation in the Gulf. In the Arabian Sea, USS Hawaii, USS Ohio, USS Jimmy Carter, and the USS Halsey all began patrols to monitor the situation there. All idle KC-135 Stratotankers were readied to commence refueling operations. An RC-135 Rivet Joint from Al-Udeid Airbase in Qatar was launched to gather some intel in the Persian Gulf area. At Diego Garcia, the B-2 Spirit of Alaska was armed with GBU-28B/B Bunker Buster bombs. When the time was right, Spirit of Alaska would be the first choice to take out the Nuclear Storage Bunker. The B-2 Spirit of Texas would be readied with AGM-158A JASSMs as backup. There were also B-52s at Diego Garcia being armed with more AGM-158As and GBU-10E/B LGBs as additional reserve. At Al Dhafra in the UAE, there were three E-3C Sentries ready to go, but the squadron of F-22A Raptors at the base needed to arm to provide them protection. Also at Al Dhafra were a pair of U-2s, which ultimately might provide the definitive location of the TEL vehicles. 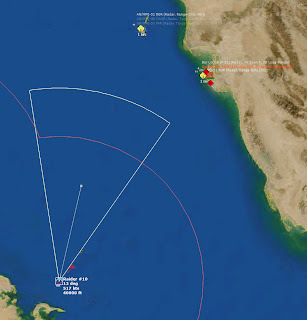 It was considered too risky to simply send a U-2 to the target area by flying directly over Iran or Pakistan, so it was decided to prepare a long range reconnaissance mission over Iraq, Turkey, Armenia, Azerbaijan, Turkmenistan, Afghanistan, and then the final run into Pakistan. Multiple refueling assets would be needed to support this mission, so several KC-135s were readied. If time becomes short the risk assessment might change, and a second U-2 sent direct. 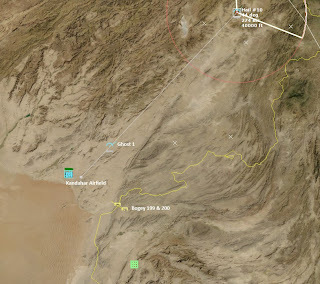 Some other aircraft, for example 8 F-15E Strike Eagles at Djibouti-Ambouli International Airport and A-10Cs at Bagram AB are kept in reserve to respond as the situation develops. Two bogies are detected by the radar station at Kandahar, near PAF Samungli / Quetta International Airport, heading west towards the Afghanistan border. 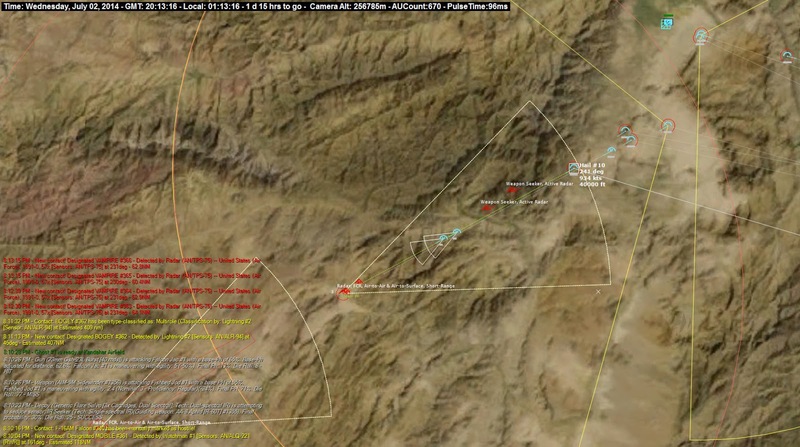 It is likely they are F-7P Airguard fighters on a patrol. Soon after, more contacts are made near PAF Peshawar. This time it is likely a pair of JF-17 Thunder fighters. 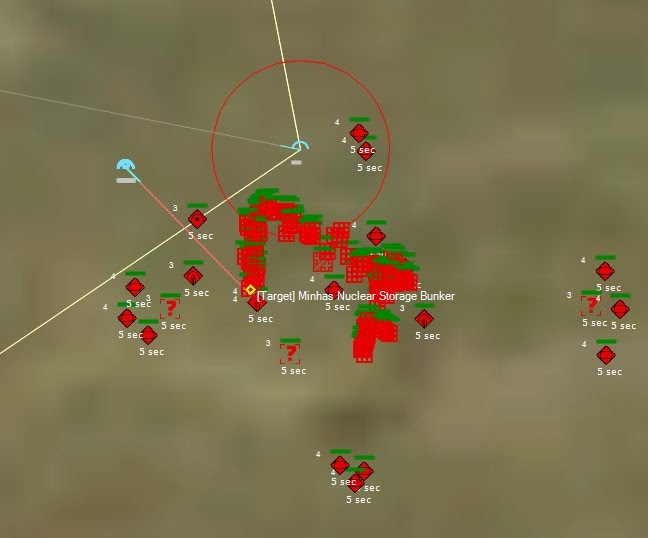 The radar at Kandahar has been tracking Bogey 199 and Bogey 200, which at first appeared to be on patrol, but now it looks like it is moving towards Kandahar, and getting dangerously close to the border. 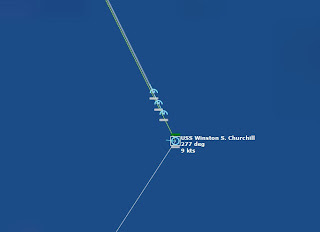 The nearest fighter is Hail 10, 200nm away. Bogey 199 crosses the border into Afghanistan. 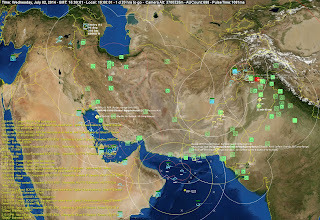 Hail 10 is ordered to intercept, but it is so far away that if the Pakistanis mean to attack, there will be little it can do. A few minutes later, both bogies turn around and re-enter Pakistan. 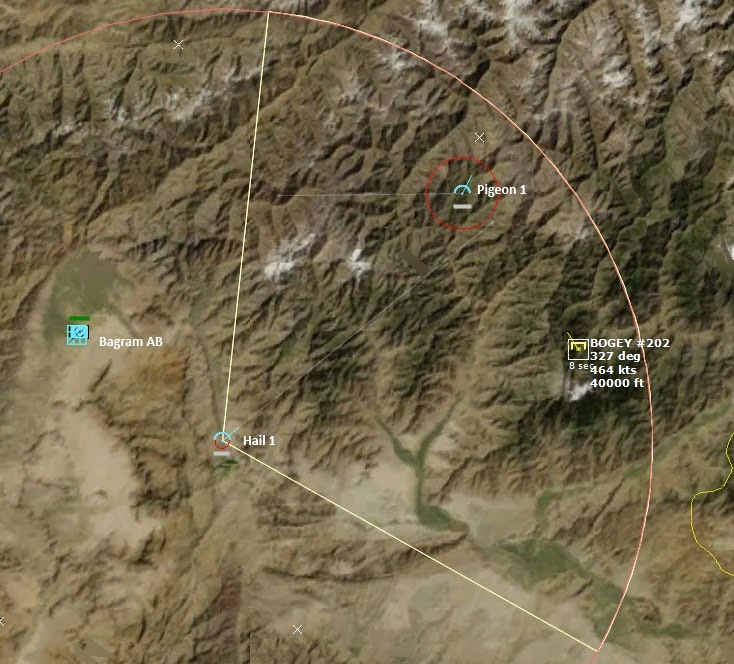 Bogey 202 crosses the border into Afghanistan in the northern ADZ. They’re pushing it. 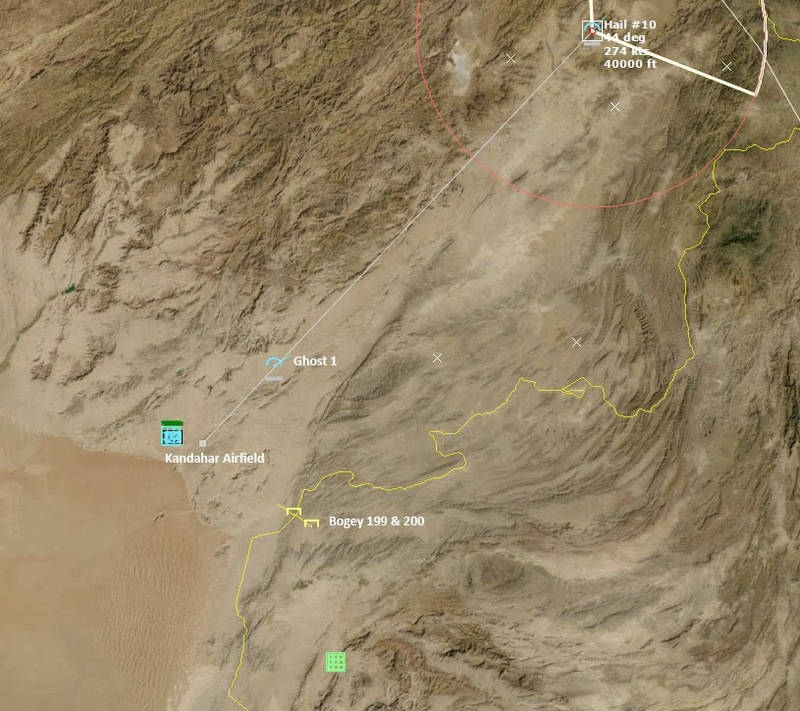 Bogey 202 is 25nm over the border now, and heading towards Pigeon 1 (the MQ-9B Reaper on recon). Hail 1 is tasked to intercept, while Pigeon 1 is ordered to evade. 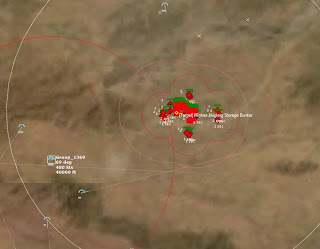 Bogey 202 passes close to Pigeon 1, buzzing it, while Hail 1 continues closes to within 10 miles of Bogey 202. It looks like a game of chicken is about to commence. 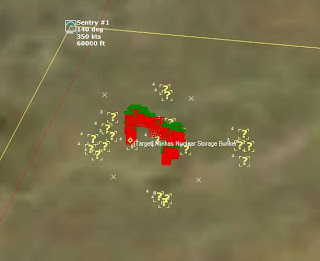 Hail 1 and Bogey 202 pass within 1000 meters of each other at a speed of almost 900 knots. Hail 1 identifies it as a JF-17 Thunder. More Pakistani fighters violate Afghanistani airspace. F-16s intercept them and identify them, but otherwise leave them alone. It appears they wish to provoke the US into firing first, but US Forces obey their ROE and refrain from taking the bait. Hours later, no shots have been fired. The Pakistanis have been violating Afghanistani airspace again and again, but have refrained from firing. A Global Hawk, Sentry 1, has been launched from RAF Akrotiri in Cyprus and is heading toward the target, passing north of Iran. Refueling aircraft have been set up in strategic locations, in preparation for the upcoming strikes. Considering the importance of what is going on, things are relatively quiet. With tanker assets nearly in position, Al Dhafra launches a U-2, Watchman 1, on a recon mission to follow up after the Global Hawk. It will take a roundabout course, along the Persian Gulf, through Iraq, and then north past Iran and into Afghanistan. At this point it is considered to send a Global Hawk direct from Al Dhafra to Afghanistan, attempting to thread the needle between Iranian and Pakistani radar coverage, but other reconnaissance assets are on the way, and it might be jumping the gun to stir the pot. An SR-71 would be nice about now. The hours have passed quietly, with recon elements on route. Pakistani aircraft continue to buzz their US counterparts across the border with Afghanistan, and one JF-17 Thunder is fixated on Ghost 1. It looks like Iran’s paranoia got the better of it. 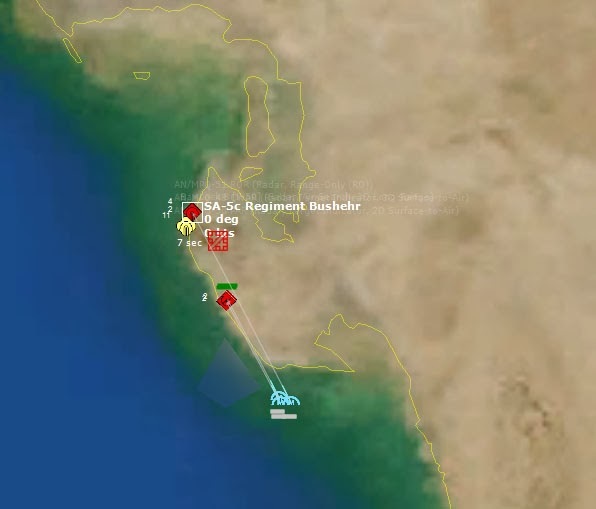 SA-5c Regiment Bushehr opens fire. All Iranian units are now considered hostile. A pair of SAMs lock onto Raider 10, one of the F/A-18s out of Ali Al Salem AB in Kuwait. Fortunately Raider 10 evades both SAMs. In response, USS Winston S. Churchill launches a salvo of 6 RGM-109C Tomahawk Blk III TLAMs, a pair at SA-5c Regiment Bushehr, two at the Bushehr North radar site, and two more at the Bushehr South radar site. Another SAM is detected heading towards Raider 10, which successfully spoofs it with a its AN/ALQ-165 ASPJ jammer. Raider 10 launches a pair of AMRAAMs at an Iranian F-4E Phantom II. The first AMRAAM hits and destroys the F-4E. Yet another SAM tries a shot at Raider 10, which successfully evades it. Sentry 1, the Global Hawk out of RAF Akrotiri, crosses the border from Afghanistan into Pakistan, heading for the Minhas Nuclear Storage Bunker. In the meantime, the Tomahawks launched from the USS Winston S. Churchill close in on Bushehr. The Tomahawks impact and all three targets are destroyed. It is hoped that this will convince the Iranians to leave US forces alone. Sentry 1 closes to within 50 nm of the target area. 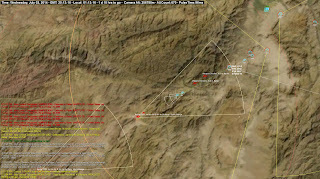 Closing to within 30 nm, Sentry 1 begins gathering intelligence of the target area. So far there appears to be nothing threatening Sentry 1. Sentry 1 is 7nm out. Seconds later, Bogey 286 is observed by Hail 5, an F-16C on patrol out of Bagram AB, attacking a friendly unit. It’s likely that the Sentry 1 is the target. No reason not to turn on the radar now. Instantly the screen lights up. 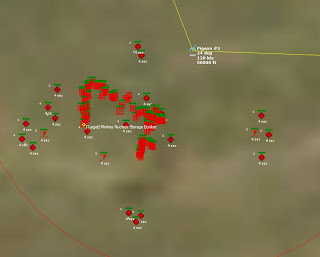 More than twenty ground targets are detected, and soon Sentry 1 begins classifying them. Some are armor, some AAA, some SAM sites. Bogey 286’s target becomes clear, as Pigeon 1, a MQ-9B Reaper, is shot down. Hail 5 and Hail 12 are ordered to take out the Bogey. Immediately afterwards, a AIM-9P-4 Sidewinder attacks Sentry 1, and fortunately misses. 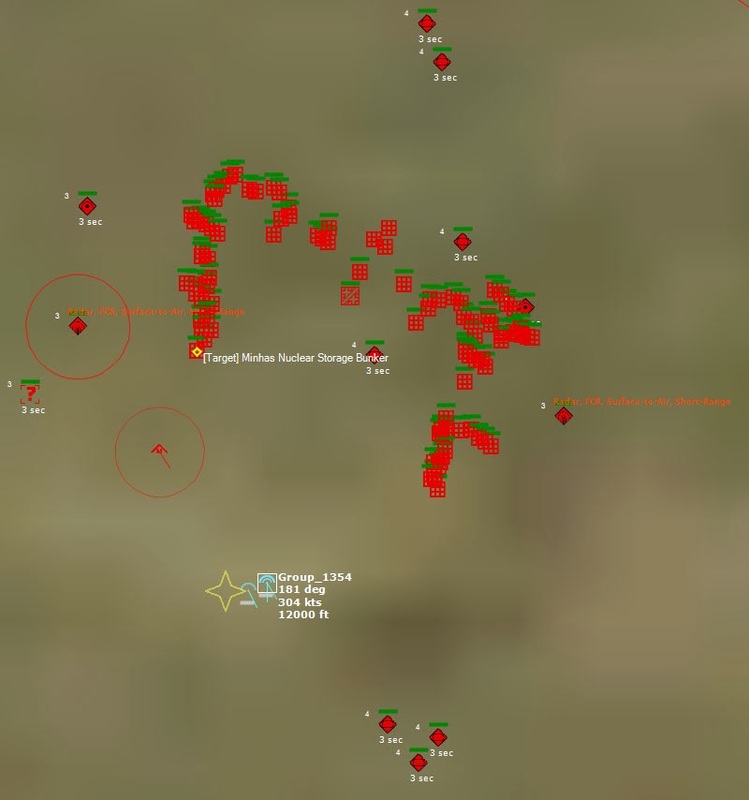 A second Sidewinder misses as well. Hail 5 and Hail 12 unleash their AMRAAMs at Bogey 286, but all four shots miss. More Bogeys appear, so it seems that the Global Hawk’s presence has started an air battle. 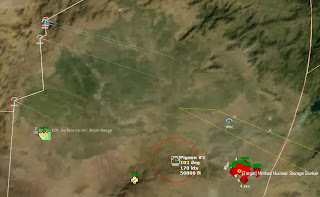 The air battle intensifies as a Pakistani aircraft fires on Hail 5, while Hail 10 returns fire. Hail 5 survives the shots directed against it. Its attacker does not. Later Hail 12 shoots down another Pakistani aircraft. All F-16s at Bagram are being loaded for bear, with 2 Sidewinders and 4 AMRAAMs apiece. Sentry 1 continues its orbit of the target area, while Pigeon 2, a second MQ-9B Reaper, flies to back it up. 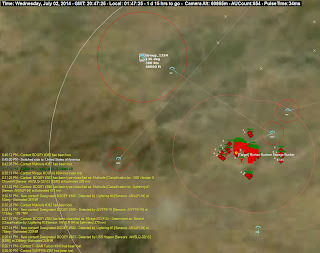 July 02, 2014, 19:47:03Z Intelligence is received that Indian and Pakistani aircraft have started shooting at each other. By analysis of radio transmissions, it appears that India has lost 2 MiG-29 Fulcrums in a fight against Pakistani F-16s. July 02, 2014, 19:49:55Z As Pigeon 2 closes on the target area, a flight of four F-16s (Hail 2,3,6, and 7) follows to clear the skies above. As Hail 7 passes over Peshawar, a pair of SAMs (Aspide 2000s) are launched at it. Hail 7 evades the first salvo, but then another pair of SAMs are launched, and Hail 7 evades them too. Hail 2 and Hail 3 fire AMRAAMs at another contact, and one of Hail 3’s AMRAAMs take out a Pakistani Erieye AEW&C aircraft. July 02, 2014, 19:56:56Z Pigeon 2 does a flyover of the target site, and IDs two more ground targets. In the area there are only three targets that have not been type-classified. Worryingly, none of the ID’ed targets are TEL vechicles. It is possible that some have been classified as Armor, of which there are many. On its next pass, Pigeon 2 will be ordered to descend to a lower altitude in the hopes of getting better information. More Bogeys are launched. Hail 3 shoots down a Skybolt, while Hail 3 and Hail 7 engage two more Bogeys out of Benazir Bhutto International Airport. Both Bogeys turn out to be Erieyes, and Hail 7 claims both kills. Pigeon 2 descends to 12,000 feet, which is low enough to do some real identification. Bingo. TEL vehicles detected. Missile Artillery 299 is classified as a SSM Bn (Hatf 6 [Shaheen 2] TEL), and Missile Artillery 300 is classified as a SSM Bn (Hatf 7 [Babur] TEL). Pigeon 2 continues its sweep to look for more. July 02, 2014, 20:11:01Z With TELs identified, there can be no more delay. 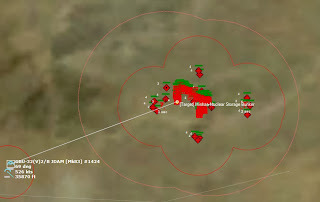 A massive strike on the target to take out all mobile launchers and the storage bunker would be preferable, but there is no telling when the missiles could be ready to launch. They must be taken out ASAP. Therefore, four A-10s out of Bagram, each armed with 4 GBU-12D/B Paveway II LGB [Mk82] are tasked to strike the TEL vehicles immediately. A follow-up strike will go after the storage bunker. Two Pakistani F-16s are headed towards Bagram, so the newly launched and heavily armed CAP of 4 F-16s from Bagram is sent to intercept. 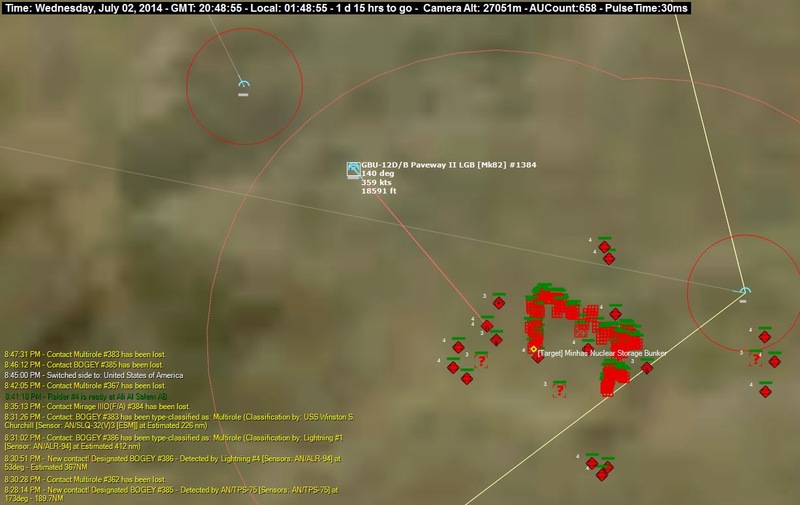 July 02, 2014, 20:13:06Z AMRAAMs fill the sky as the Bagram CAP and the Pakistani F-16s shoot at each other. Hail 5 is the first casualty, evading the first AMRAAM, but not the second. The attacking Pakistani F-16 is shot down next. The trailing Pakistani aircraft turns out to be a F-7P Skybolt and not an F-16 as was first thought, and Hail 10 shoots it down. Pigeon 2 takes a risk in descending to 7000 feet to attempt to ID the remaining ambiguous targets, but is shot down by a SAM. The A-10 strike package in en route, and Pigeon 3 begins taxing to take off. Two Harriers at Kandahar Airfield are ready with GBU-32(V)2/B JDAM [Mk83], so they are tasked to launch immediately to follow up the A-10 strike. Time is of the essence. 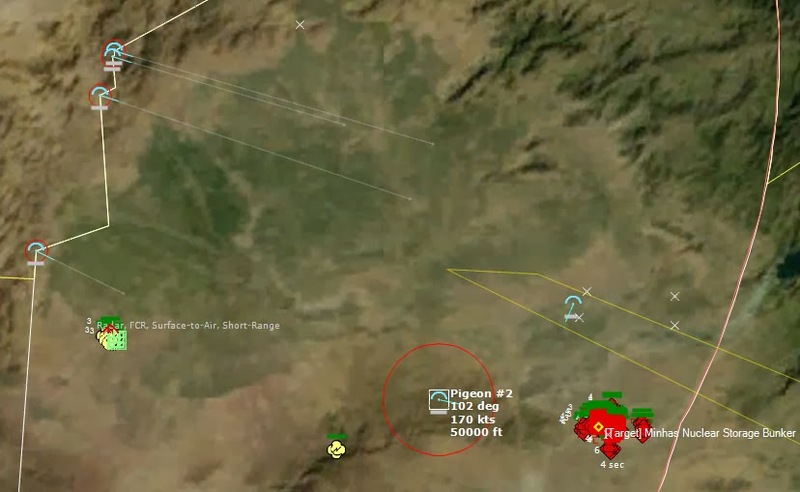 July 02, 2014, 20:25:15Z Hail 1 is shot down by an Aspide 2000 out of Peshawar. The A-10 strike is diverted northward to give Peshawar a wide berth. July 02, 2014, 20:47:25Z The A-10 Strike, Group 1354, is inbound hot. Inbound at 40,000 feet, they are ordered to descend to a lower altitude to ensure their bombs have a better chance of hitting the target. July 02, 2014, 20:48:55Z Bombs away. 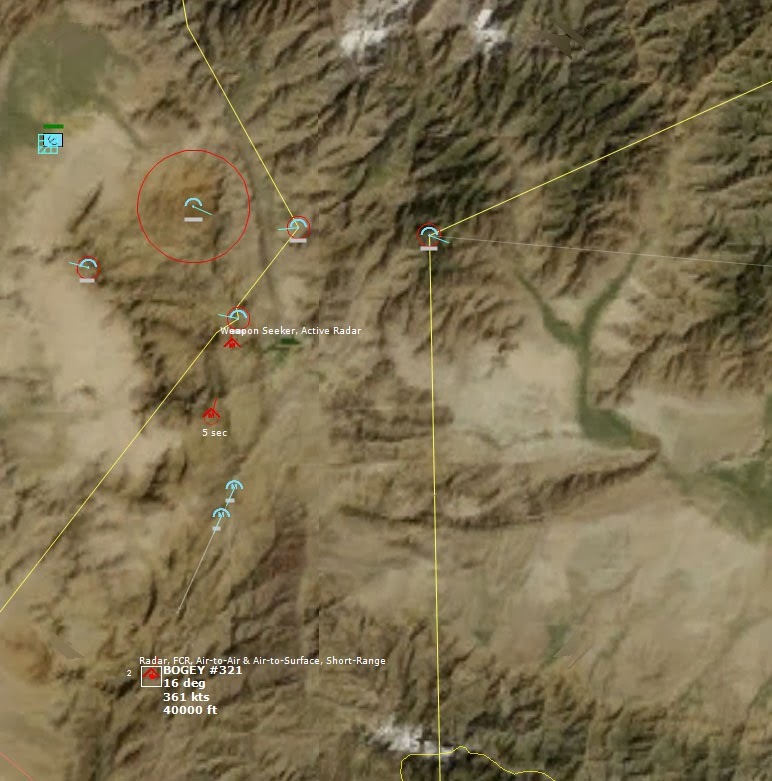 July 02, 2014, 20:49:21Z The first target, SSM Bn (Hatf 7 [Babur] TEL, is hit and destroyed. Bombs away on the second target. 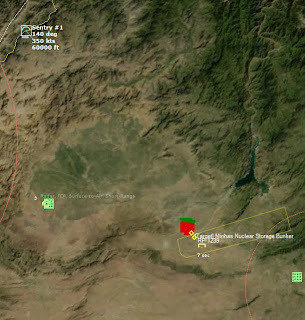 July 02, 2014, 20:49:36Z The second target, SSM Bn (Hatf 6 [Shaheen 2] TEL, is hit and destroyed. The A-10s are tasked to go after the unidentified mobile targets now. 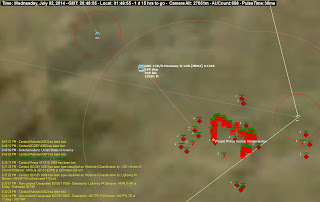 July 02, 2014, 20:49:44Z The third target is destroyed, which turns out to be a QW-1 Vanguard MANPADS. 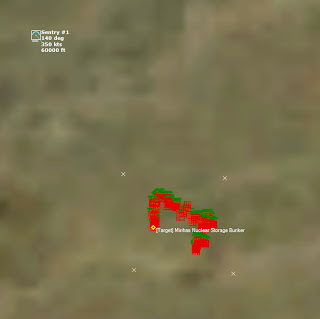 Seeing the difficulty in ID’ing the other targets, it is likely that they are MANPADS as well. SAMs are launched at the A-10s, so they take evasive action. Hog 1 is hit and destroyed. July 02, 2014, 20:49:55Z Barrages of SAMs are fired, and Hog 2 succumbs as well. Seconds later, Hog 4 is hit. And then, attempting to egress the area, Hog 3 is shot down. The entire group is destroyed, but the mission was a success. 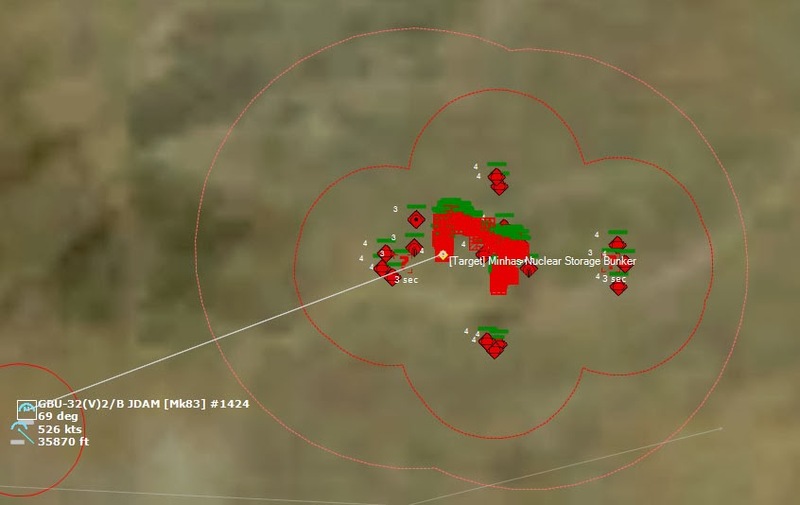 The Harrier Strike out of Kandahar is now tasked to drop all of its Mk83s on the nuclear storage bunker. Two more A-10s out of Bagram will be ready in two hours, and two more Harriers from Kandahar in four. With the two known launchers destroyed, it is hoped that the level of urgency has decreased, but US forces will not rest until the bunker is destroyed. July 02, 2014, 21:08:00Z The Harrier strike, Spade 1 and Spade 2, is inbound hot. July 02, 2014, 21:08:21Z Bombs away. July 02, 2014, 21:09:30Z Impact. Spade 1 reports a BDA status of Light Damage and a Severe Fire. As Spade 1 and 2 egress the target area, it is by no means clear that the damage done is sufficient. Four 1,000lb bombs might not be enough. Unfortunately it will be hours before another strike package is ready. 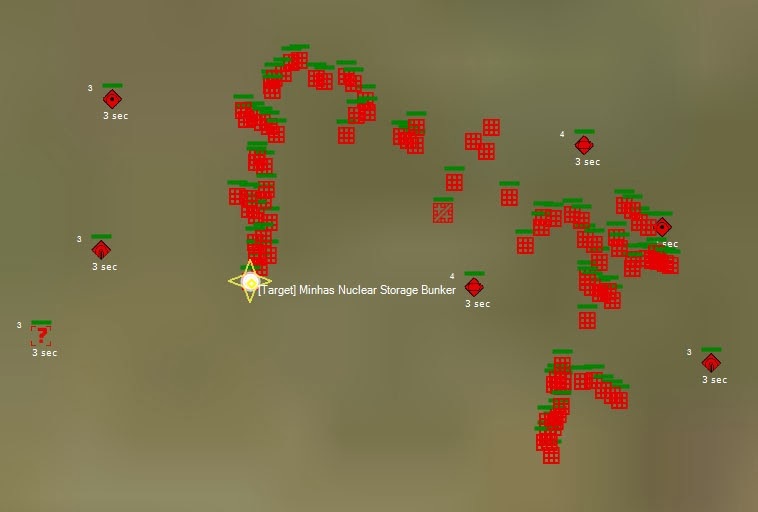 July 02, 2014, 21:12:54Z Fortunately, the fire is severe enough that after only a few minutes, secondary explosions take over and the nuclear storage bunker explodes! Whew! I suppose if I really wanted to, I could have amassed a huge strike package, plowed through any and all opposition and just annihilated everything in sight, but I wanted to attempt this mission in a more "realistic" fashion, with an eye to minimizing losing assets or attacking anyone I didn't need to. My strategy of taking out the TEL vehicles before the bunker made sense, and ultimately was a smart decision. At several times I was tempted to just send in a strike force to start taking out all the ground forces in the area, but I am glad I was patient enough to wait. I ended up losing my entire flight of A-10s sent in to take out the TELs, but that was due to having them descend to 12,000 feet before dropping their bombs. They dropped LGBs, so perhaps descending was completely unnecessary, but I felt I had to take the risk, because I didn't want to miss and trigger the terrorists to launch. The Hog drivers will be decorated and remembered for their gallant sacrifice. The US government will not be apologizing for shooting down Pakistani aircraft. If Pakistan wants to be part of the nuclear community, it has to be more responsible. Neither will the US government apologize for its attack on Bushehr, as Iran needs to learn that there will be consequences if it fires upon US forces. Thank you for the excellent review of this complex scenario.